Amazing news! Two episodes of Star Trek: The Next Generation will be shown in theaters on Monday July 23, 2012 at 7pm. To celebrate the 25th anniversary of the show and the release of Star Trek: The Next Generation on Blu-Ray there will be special screening of two of my favorite episodes from the series in theaters. This summer “boldly go where no one has gone before” and don’t miss the only opportunity to see two of the most popular Next Generation episodes, Ep. 106 “Where No One Has Gone Before” and Ep. 114 “Datalore” on the big screen. How cool is that? I don't think a television show has ever been released in theaters. The resolution must be incredible. To find out if it's coming to your city and get tickets (on sale June 8th) go here. Announcement: In two days we're announcing a very special giveaway. Come back Thursday and check it out! 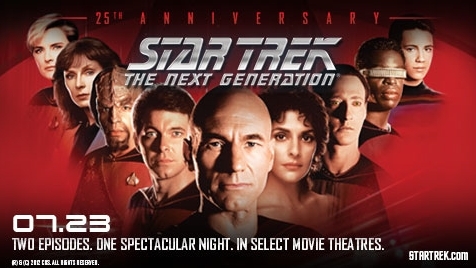 Would you watch Star Trek: The Next Generation in the movie theater? Do you have any fond memories of the show? Yes I would! I'll go see if it's coming to our city. I think it's gonna be great Alex. Who knows what other shows will come to the theaters next! It's coming to two theaters near me. Nice! My wife's not a star trek fan, but she just might have to take one for the team in this case. M pax, you never know. I was surprised it's in Phoenix. Nice James, it should be great time! Sadly, it's not being shown in UK cinemas. David, too bad it's US only. You're right. Best of Both Worlds would be great on the big screen! It's a little weird to consider a couple early series episodes for theater showings, but those would have to be the selections, if any. It'll be like The Motion Picture back on the bigscreen! Yeah Tony, only fewer leisure suits. But... WHY THOSE TWO EPISODES??? I mean, if you're going to put it up on the big screen, why not Best of Both Worlds? WHY WESLEY EPISODES? THIS IS ALL A PLOT BY WIL WHEATON!! You might have something there Nate! Wheeeeaaatoooooon! Just got my tickets! Thanks for the heads up!